Actress/singer Loretta Swit hardly needs an introduction. Having played Margaret "Hot Lips" Houlihan for 11 years in TV's M.A.S.H. (1972-1983), with multiple award nominations and two Emmy wins, the lady has become a household name. Few realize however that she began her career on stage and that the theatre is her first love. Currently onstage at the NoHo Arts Center, Swit is essaying three roles in Joshua Ravetch's One November Yankee which will run through January 5, 2013. In our chat she talks about the play and other theatrical roles she has played. How did you become involved in One November Yankee? I did the original reading at the Pasadena Playhouse...a mutual friend of ours introduced Joshua Ravetch and me. She had been reading his plays and called me and said, "I swear, he doesn't know it, but he's writing for you. I hear your voice when I read the play, I hear you saying this dialogue." So she said, "Have a read!" He sent me the script, and I loved it. I loved the concept; I loved the fresh approach with a brother and sister relationship. I have a brother. It intrigued me; it satisfied me. "What a delicious concept!" I loved all three characters. Actually, I loved all six. I liked the brother's characters too. We did this reading three years ago very successfully. I never read a review like that in my life. I mean he just went on and on and accurately sort of described the play as "those Russian dolls that keep unfolding". I feel that about the play, so much keeps getting revealed. And I love the La Ronde, the echoing back whether it's Hirschfeld or Cartier or Cantano, which is Josh's invention, the lawyers, the Canadian city, the Canadian bar, the librarian shelving other people's accomplishments, the signature is amplifying accomplishments...all the play on words...I really loved it. It's so intelligently written, you almost have to see it a second time. There's too much for one viewing. I agree with that. I have told many of my friends to come back at a matinee, let's say and just see it again. I'm an art collector, have been for years, and I paint. Needless to say, the artwork in my houses, apartment is extensive. So many of my friends have said, "I've got to come back because there's so much to see." And I feel that way about this play. There's so much to get. And...we did two readings. I did it with Robert Forster. He has this booming film career, and I warned Josh at the time that he'd better have a short list. When I agreed to come and do it at NoHo Arts, we did a reading, again with Robert. But when the time came closer, he was in the middle of two films back to back. Josh said that Harry (Hamlin) had read the play, liked it and was interested. I said, "Well that would be fine for me! I'll be thrilled with that." He's just wonderful. I've not worked with him before but have known him socially for years. We have this chemistry that is amazing. I love the humanity in the play and how well you both bring that out. Is this the first play you've done in a while? God no! No! This is being fitted into a tour of Eleanor, which is a one-woman play about Eleanor Roosevelt. I've done it twice and have bookings spattered throughout 2013. I have to stop in the middle of that and do Murder Among Friends. I have another play in Canada that I'm considering doing. I do theatre, that's where I'm from. You'd be wonderful as Eleanor. I'd love to see that. The clothing and the wig, everything...I'm very pleased. Rhoda Lerman wrote that...Eleanor Her Secret Journey. You also have been doing Shirley Valentine for which you won a prestigious Sara Siddons Award. I've been doing that since 1991. Not consecutively, but every once in a while some theatre where I've been or where I haven't been will call and say, "Can she do Shirley for us for a couple of months?" or whatever, and I do. I toured Canada, I toured the US. Shirley went as far as Guam. I learned so much from doing that. Why do you think audiences love Shirley so much? She is so human, so real. Her foibles and follies and aspirations, dreams and pain are so human. And the fact that she does break out of this mold. She's buried under labels. She's mommy, she's Mrs. Bradshaw, the next door neighbor; she's the lady who shops at the butcher shop ... you know what I mean, she's lost her identity so totally... and there's this beautiful speech about how she remembered the beginning with Joe, her husband. They painted each other. They were painting the kitchen and they decided to have a paint fight. And they both went into the bathtub together to wash off the paint. So she paints this romantic young picture, and she doesn't quite understand why it has to change. And she's right, it doesn't have to change. In Greece, she rediscovers herself through other eyes. These eyes have not put labels on her yet. She blossoms once again into the Shirley she is and gets it back. The end of the play is very hopeful. I'm convinced in my mind's eye, the sequel, Joe stays. They both grow. It's a play about growth and being open to change and growth and happiness. Kind of like the message in One November Yankee! Exactly...all of those characters are so human. The bickering is so human. The love, the bond, all of those things...so human and loving. I don't have a favorite character. I love them all so much. You were in a landmark TV show M.A.S.H. Do you ever watch TV today? Are there any programs that come up to Larry Gelbart's achievement? I'm a movie buff. My mom would take me to a double feature. We'd come out, go have Chinese food and then go back into another cinema and see another double feature. I feel I'm a child of the movies. The difference was...when I said I wanted to be an actor...usually children when they go to a movie, they're dazzled by the character. they're dazzled by Scarlett...I was dazzled by Vivien Leigh. I wanted to be the actor doing the work to get that character. That's when my mother knew I really wanted to be an actor. It wasn't the spangles and the gloss, the glitz and the bling, it was work and the creation, the creativity that went into it. That for me was the excitement. Anyway, television...now ...Gelbart is a tough act to follow. After M.A.S.H., I did one pilot that was so wonderful. Was that Cagney and Lacey? I did that, but that was still during M.A.S.H. What I'm referring to was after M.A.S.H., written by Allan Katz. If anyone could take up the mantle from Larry (Gelbart), it would be Allan Katz. He was one of our writers on M.A.S.H. I can't say enough about him: his wit, so glib, so quick like Larry. The show was called Sam. It was delicious. It was absolutely delightful. A New York Times critic gave it a half a page, saying "Why isn't this on television? It's wonderful." It was an ABC project; they didn't know what to do with it. It was a little sliver of sunshine that we were trying to get on the tube. Frankly, I have not read anything since that I would consider doing. Television is hard work. It's all hard work. Theatre is hard work. I tell you, I have bruises from changing backstage. Those quick changes are really difficult. Do you have a favorite stage role? 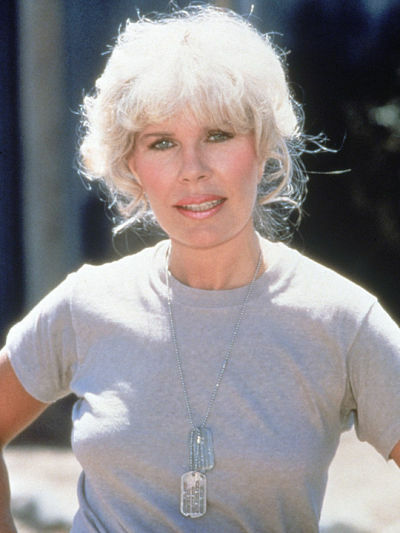 It's clear: Loretta Swit can do it all; she can play any role in any medium. Let's not forget as well Swit's activism and charitable contributions chief among them her association with SDF, the Search Dog Foundation which takes rescue dogs and places them with firefighters to hunt down and rescue victims of tragic accidents. Swit is also an avid painter. 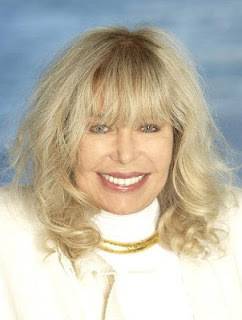 Still a stunningly beautiful woman 30 years after M.A.S.H., Loretta Swit, thankfully for us, shows no signs of slowing down in any arena. Catch her in One November Yankee through January 5 at NoHo Arts Center!